The expansion has been out for a few days now and most of us will reach level 100 in the coming days. Raids are locked at the moment and Warlords of Draenor's end-game is not really about daily quests, so you might want to pass the time with something else. Here are ten suggestions. Gear up in Heroic dungeons: Once you're 100, four new dungeons unlock and a total of eight await five-man groups to get all the loot. Mobs drop items with an item level of 630, which is just perfect for a fresh level 100 character. Challenge Modes—where you need to complete the dungeon as fast as possible—are back, so if you're in a good group or guild you might want to try those too. Finish all the remaining zones and do all the leveling quests: You don't need to finish every quest in every zone to reach level 100, but doing them will get you some additional rewards. Finishing a zone's story always rewards you with a free "Garrison Assembly Note," and there's always a quest here and there with some exceptional loot: a follower, some vanity pet or something for the Toy Box. Get Apexis Crystals: Apexis Crystals are a new currency in Warlords of Draenor. You can use them to buy all kinds of things, like vanity pets, but most importantly raid-ready gear with an item level of 630 that can be further upgraded. You can get Apexis Crystals from killing rares around Draenor, from level 100 dailies available in your Garrison, completing Inn dungeon dailies, doing work orders for medium and large buildings also in your Garrison, and there's a rare follower mission that rewards you Crystals instead of the usual XP or gold. 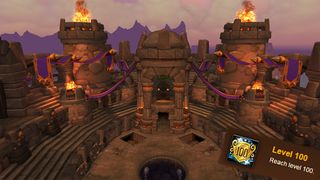 Queue up for Ashran and grab your PvP gear: Ashran is the new end-game zone for level 100 characters. Once you get there you'll be flagged for PvP and queued automatically (you might have to wait a lot though) for a 100 vs. 100 world PvP battle for the island. Raise your reputation with the islands' factions and collect "Artifact Fragments" so you can buy all the PvP gear with an item level of 660. Hunt for treasure and rare monsters in Nagrand: Nagrand is full of hidden treasures and some rare elites that can't be soloed (say hi to antelopes with as much HP as Old Gods!) but sometimes drop really great "binds on equip" gear, and that means one thing: Mad amounts of gold (20-30 or even 100k per item) on the Auction House. Get your Garrison ready for raiding: Raids unlock in early December so there's time to prepare. If you're seriously into raiding, you might want to build everything in your Garrison around that: Get a Barn, the Salvage Yard, the Inn or the Tavern, a Dwarven Bunker or the War Mill if you're on the Horde side, and the best profession buildings (think about all those Flasks you'll need). Gather Garrison resources: You'll need thousands of these small wooden boxes to upgrade everything properly in your Garrison to level 3, and you'll also need them later for Tier 17 raid gear bonus rolls. The only problem is that you can't really farm them as efficiently as other currencies. A Lumber Mill and hunting rares and treasure chests will help though, but hitting the 10,000 cap will take some time. Try to flip the Auction House: Tons of new items mean a messed up economy, and as mentioned above, if you're quick enough you can make some serious gold on the Auction House. Not just with rare items, but with simpler crafted stuff. Think about what flasks, gems, and enchantments other classes might need. Gain faction reputations: Faction reputations work a bit different than those in Cataclysm and Pandaria. No traditional dailies or tabards this time. It's all about finding treasure and killing elite rares. Find them, get their loot and hand them in. This also means that getting exalted with some of the new factions, such as the "Steamwheedle Preservation Society" with only a few options available, will take some time. Solo old content: Last but not least. Go back to Pandaria, preferably with a level 100 Blood Death Knight, and burst through everything. Grab those missing achievements.